In late 2009 Interpine carried out an overlapping feature cruising inventory for the first time in South Australia’s Green Triangle region. 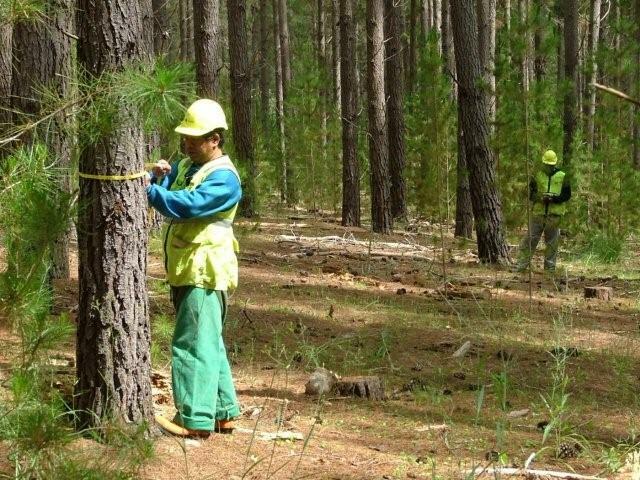 Working closely with the resource team at ForestrySA Interpine developed and implemented a cruising dictionary for Pinus radiata in South Australia with reference to the log products produced for ForestrySA’s markets. The objective of the inventory was to provide product mixes for the inventoried stands which could then be used as an input for ForestrySA’s resource management systems. These allowed ForestrySA to build a predictive model which can estimate the product mix for a stand based on predictor variables such as mean tree volume and site quality. The sample design for this measurement was the result of a purposive modelling oriented strategy, rather than a probabilistic or random sampling design; as is more common in forest inventory. The sample sites were chosen to ensure that the full range of predictor variables were included in the measurement program. In total 545 plots were established with around 90% used to fit the product mix predictor model and 10% used for model validation. Interpine were able to mobilise their field teams to measure 545 plots over 14 working days at plot locations which were already part of ForestrySA’s pre-existing inventory system. Data collected at the plot included diameter at breast height (dbh) on all trees, height on a subsample of the trees in each plot, and a full overlapping stem description for each tree. The thinning status, whether or not a tree would be removed during the next thinning event, for each tree was also recorded. Yield analysis for the ForestrySA dataset was undertaken by Interpine using the statistical computing package and forest yield analysis software YTGEN. 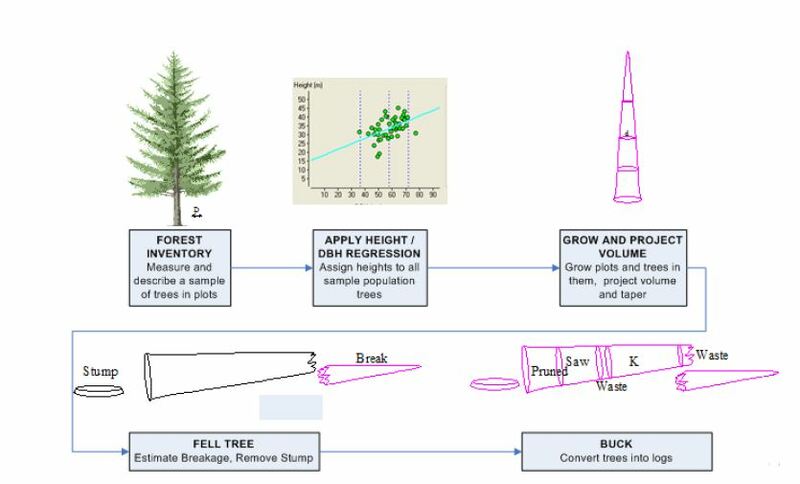 YTGEN contains a tree growth simulator for projection of immature trees to harvest age and a log level value optimiser for converting tree descriptions collected in the field into log products. Using YTGEN Interpine were able to model ForestrySA’s clearfell and thinning events as well as calculating standard forestry stand level statistics (Top height, stocking, basal area etc.). Interpine also worked closely with ForestrySA to produce alternative cutting strategies based on the log specifications for the Green Triangle region. Comaprison of alternative strategies provided valuable insights for forest planning, market analysis and valuation for ForestrySA. Since the successful project in the Green Triangle region Interpine and ForestrySA have continued to collaborate on a series of technical projects. These have included using YTGEN analysis to investigate the effect of changes in log product specifications to the ability of the resource to meet market demands. To improve volume predictions Huiquan Bi regionalised his trigonometric flexible form taper function using sectionally measured tree data collected by ForestrySA over the past 60 years. The new model parameters were implemented into YTGEN by Interpine and significantly improved agreement of volume predictions with ForestrySA’s systems. Interpine’s inventory approach was also extended to the Mount Lofty Ranges region where Interpine established a further 225 plots and again collaborated with ForestrySA on yield analysis and modelling efforts. An overlapping feature cruising dictionary has been developed and applied for the first time in South Australia. Interpine have successfully collaborated with ForestrySA to use YTGEN to provide significant benefits to ForestrySA and providing a powerful tool for analysis and forest yield modelling.